Get a picture of University Carillon. Read developing stories about the people, ministries and events of University Carillon; and find details about the church’s worshipping communities and weekly schedule. Confirmation is a journey for all Students (7th-12th Grade) that want to take eight weeks learning the foundations of what makes us followers of Jesus. 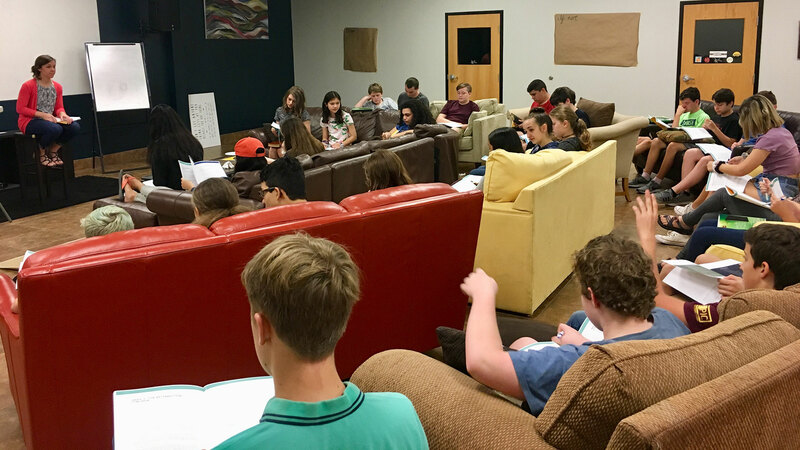 The 32 students, multiple staff and volunteers focus on reading scripture, praying, asking questions, laughing, and making great memories as they unpack what it means to be a Christian in today’s world. 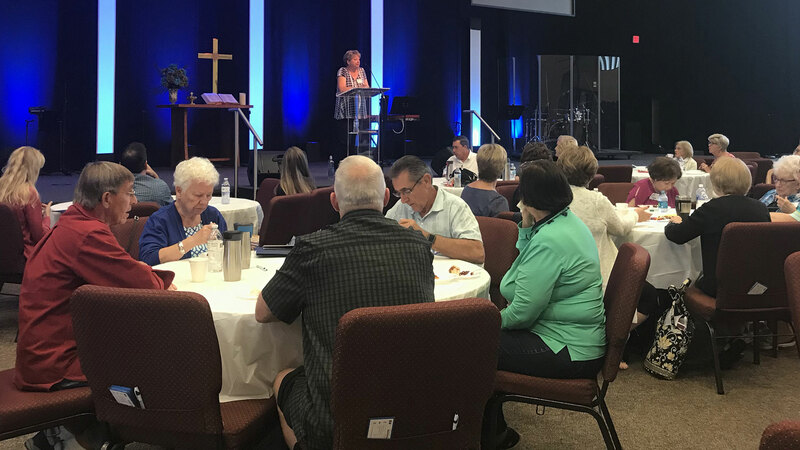 Once a year we take time to gather everyone who gives of their time and abilities to make the ministries of the church run, and we say thanks. This year our theme was JOY (because, if you lose your “y” it’s just a JOB!). In addition to learning why we don’t have the pastors do everything (because they’d mess it up royally! ), we had some great food and a great time thanking all of you! The University Carillon Early Learning Center cares for the educational, social and spiritual lives of 108 children from our community. They do this all on a very tight budget, so occasionally they invite us to support their work. 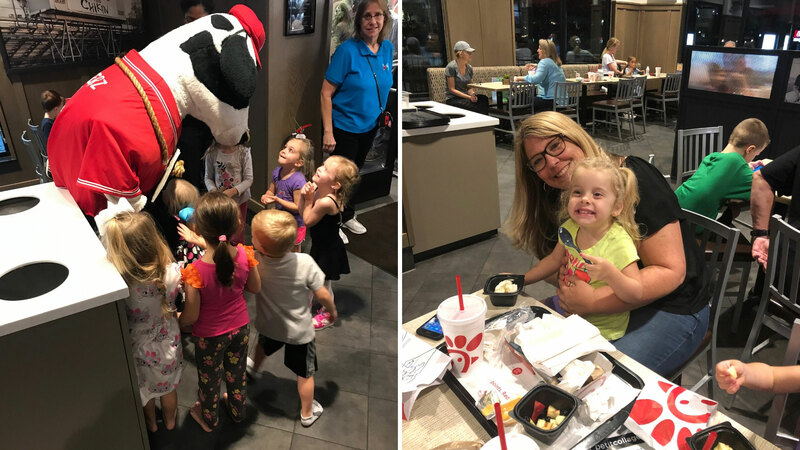 On February 28, families and individuals had a great time eating at Chick-fil-A in Oviedo, with some of the proceeds going to the Univeristy Carillon Early Learning Center. 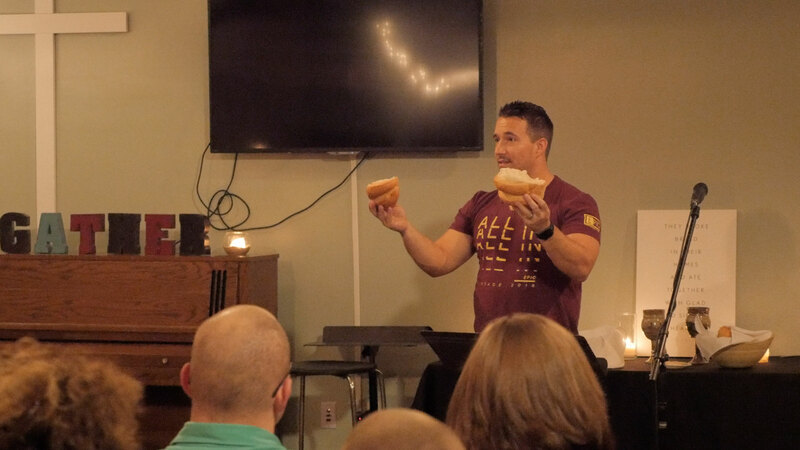 Returning to some of the practices of the early church—teaching, fellowship, prayer and the breaking of bread—the ACT2 class shares in worship, teaching and communion, and more. Wednesday Nights at University Carillon are in full swing for the spring semester with a classes such as ACT2, A Firm Foundation and Financial Peace University. Fee-based services to provide care and enhance your health: The Brain Fitness Club is designed for persons experiencing early memory loss. 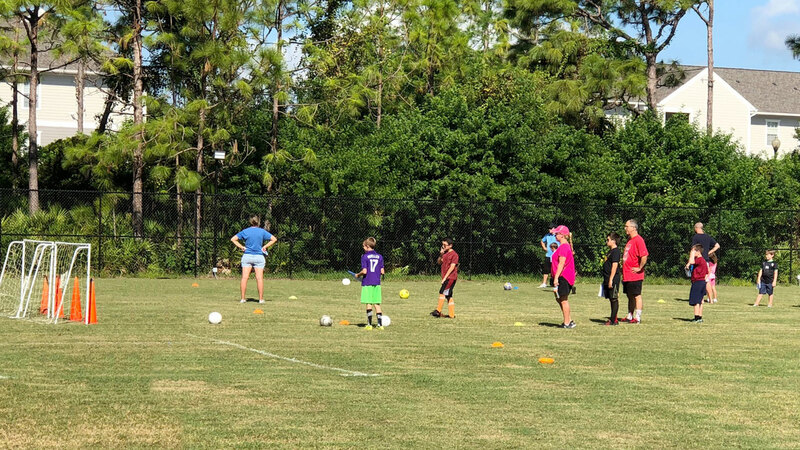 Members of BFC engage in brain-healthy activities (mental stimulation, light physical exercise and socialization), including one-on-one therapy and individualized programming designed by graduate clinicians from UCF. The program runs on a semester format, meeting twice a week. Contact: BrainFitnessClub@UCUMC.net. 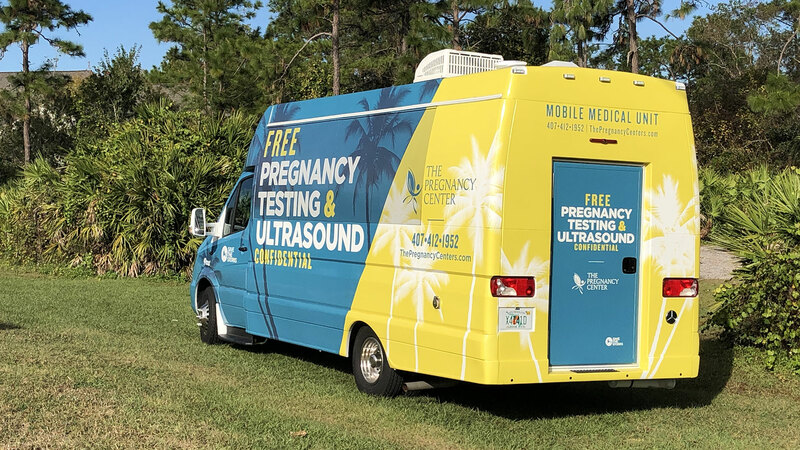 Free, confidential service: Every Tuesday the mobile medical unit for The Pregnancy Center is stationed on our property for appointments (407.412.1952) or walk-ins. 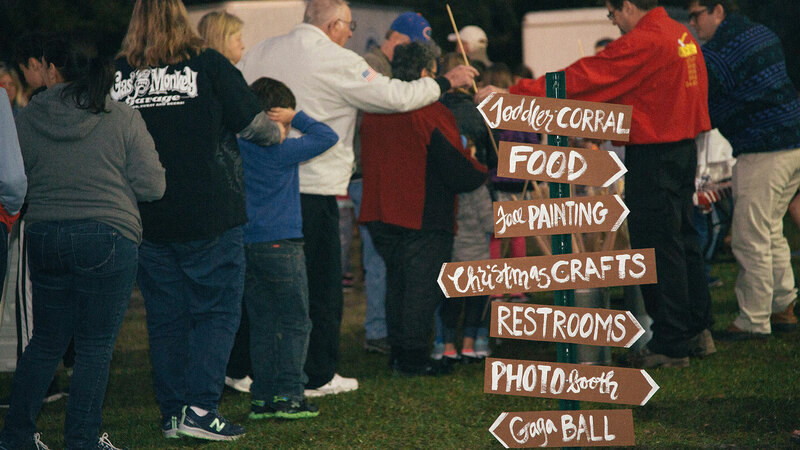 Over 50 volunteers helped put together a night of s’mores, miniature horses, food, games, face painting, photobooth, Christmas crafts and more for the community on December 22. There were over 1,100 people in attendance to share in the fun and excitement that took place here on the fields at University Carillon. The holiday season is a time of joy, but many local families do not have the means to celebrate Christmas the way many of us are accustomed. 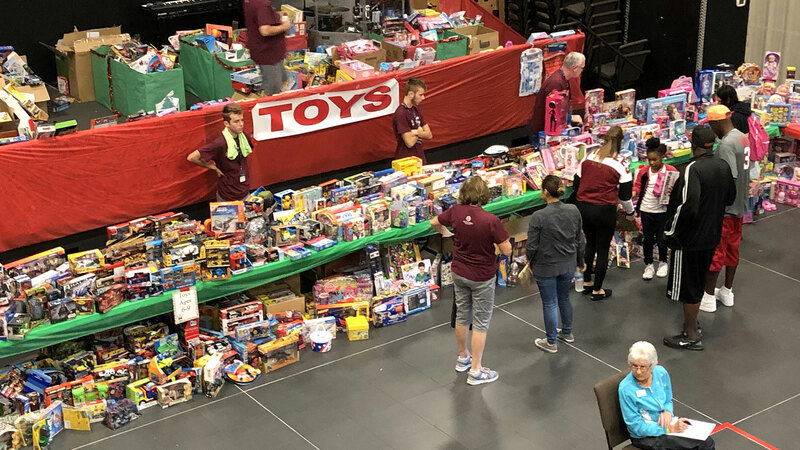 Partnering with HOPE Helps over the past couple of years has seen great reward for the community of Orlando through the “Christmas in the City” event. Church communities and organizations from around the area came together to donate finances, gifts, haircuts, food, blankets, toys, and more at CITC to help over 300 families—around 550 children blessed on Christmas day. Thank you to all of those who helped support this year’s event. 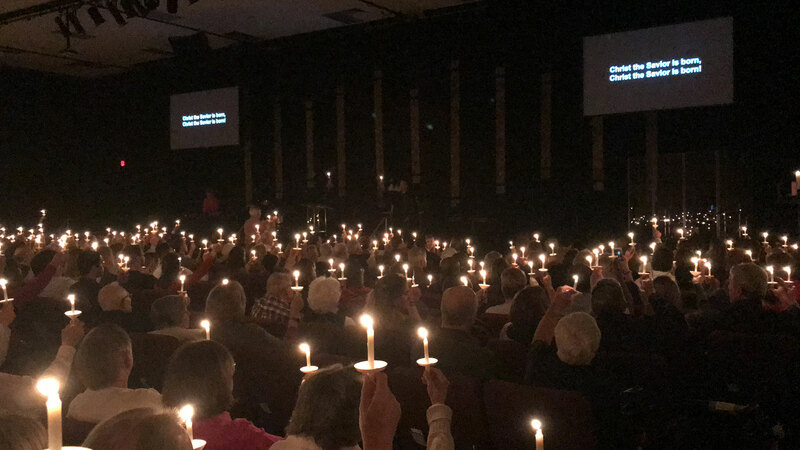 Christmas at University Carillon was celebrated over seven services throughout the weekend—including Campfire Christmas, Christmas Eve and Christmas Day. Thank you to all who made the church a home to members and visitors alike this Christmas season. 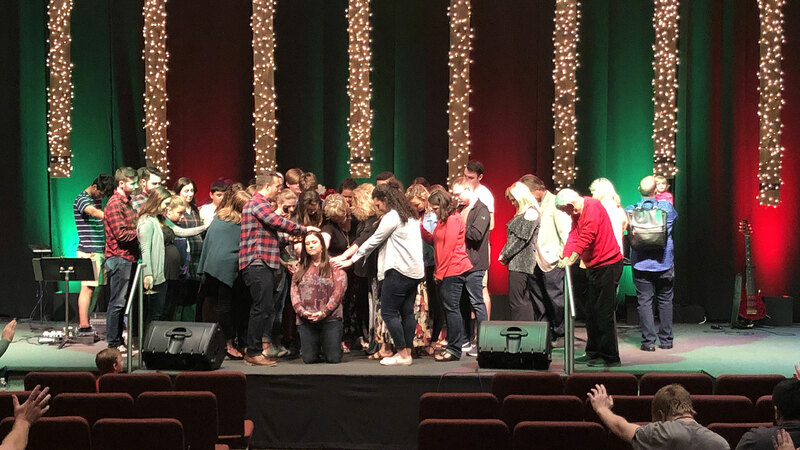 During a Vessel service, Pastor Bobby asked people who say they were impacted by the life of youth intern Tori Haun to gather around her at her baptism on December 16th. 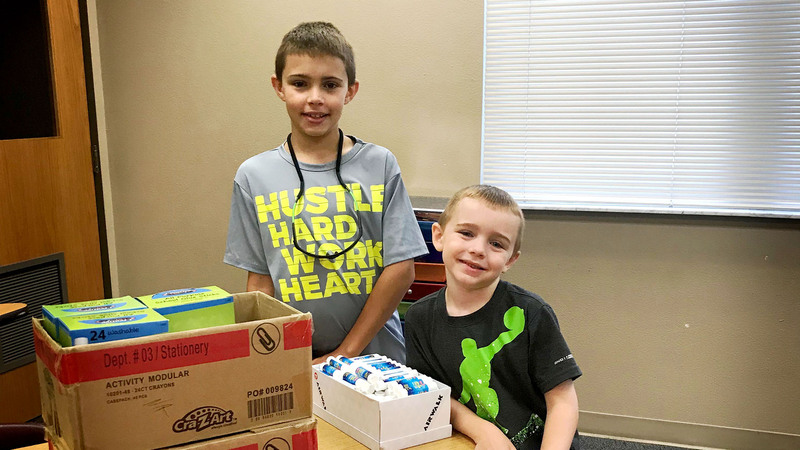 About once a week, some little assistants show up in the staff offices after preschool at UCELC to help out with “duties as assigned.” Our friends helped put together first–time and thank you gifts for our volunteers. After they wrapped up, they prayed over the gifts and the people they were going to. We have new staff members! April Lattimer has joined us as the children’s ministry event coordinator. April is a long-time member of the church and has been active in our Friday Moms ministry and in support of our family-oriented FIVE community. She and husband Charles have three children. Jennifer Brown is starting as the children’s ministry administrative assistant. Jennifer has been a part of our Saturday worshipping congregation for several years and previously owned a Christian preschool in Oviedo. She and her husband have two sons. 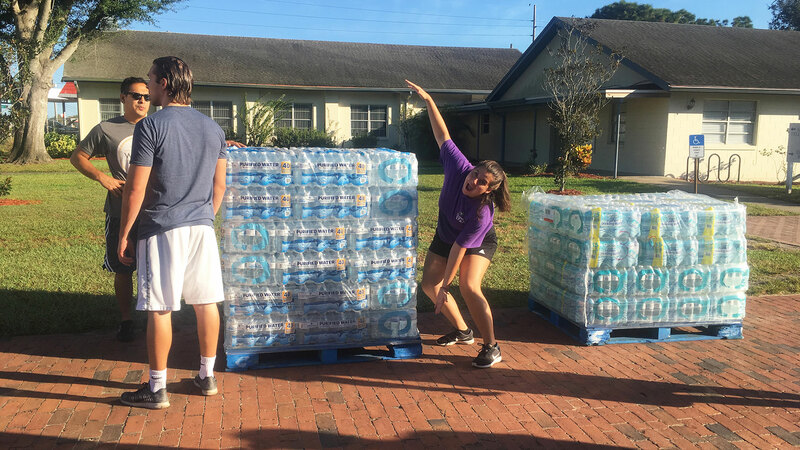 Pallets of water from Second Harvest Food Bank (with thanks to their chair, University Carillon’s Michele Byington) and cases of water from Wesley at UCF and Vessel were distributed in the Lake Downey neighborhood (near Faith UMC) on a recent serve day. 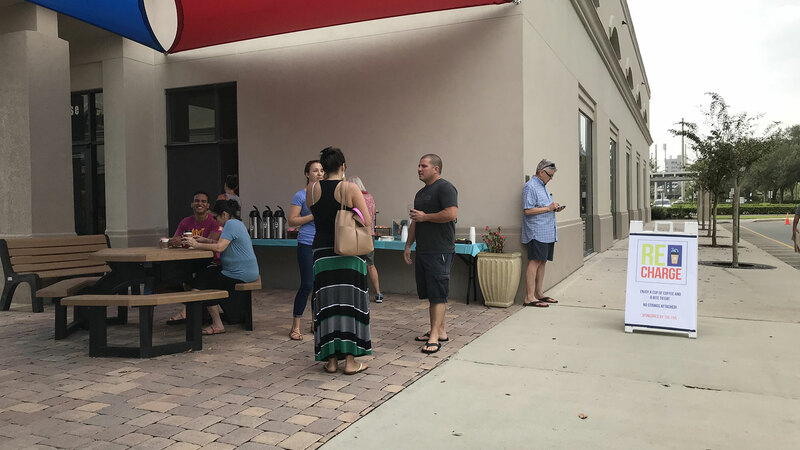 Wesley—a college ministry hosted at University Carillon—has been a presence in the Lake Downey neighborhood since July. For years there has been a collection basket in the volunteer room for newspaper coupons; and for years, Linda Bradow has sorted and forwarded those coupons to Kaiserslautern Military Community Service Center in Germany. Service members are able to use those coupons to purchase food and necessary supplies in the commissaries and the Base Exchanges. The Army Community Service Center assists more than 55,000 service members and their families and they are grateful for our assistance. This fall, University Carillon hosted several opportunities to grow in faith and spiritual discipline. Dr. Joseph Okello, associate professor of philosophy of religion at Asbury Seminary, led us in an exploration of the issues of pain and suffering in our world. After giving us some theological underpinning, Dr. Okello opened the floor for questions such as Where is God in my pain? How can God be good and all-powerful if there’s so much evil in the world? Can I still trust in God’s goodness when life isn’t good? We will continue to walk together through such questions where there are no easy answers. 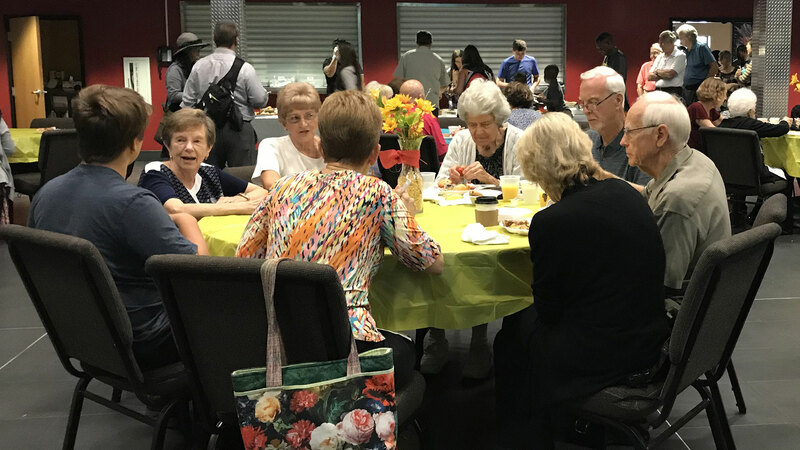 This new relationship space at University Carillon is a meal-based opportunity for those who attend the traditional worship service to enjoy networking and connection—while being served by other groups in the church (hosted here by the EPIC Youth this past month). Watch for news of the next After-9 brunch—we hope you’ll join us! 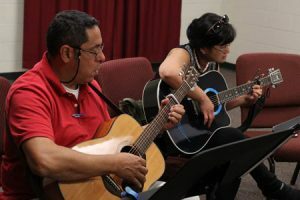 Members of University Carillon are involved in all aspects of Inside Out Jail Ministry—an organization formed to help persons while they are incarcerated and especially as they prepare to reenter society. 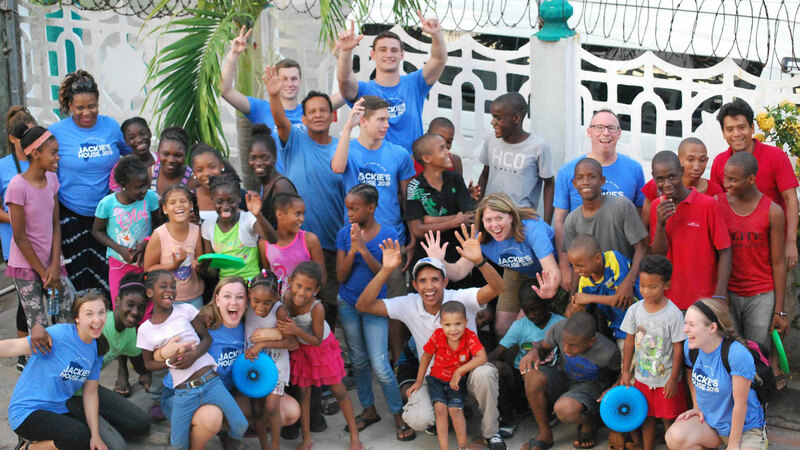 We are teachers, mentors, pen pals, worship leaders and rehabilitation guides. 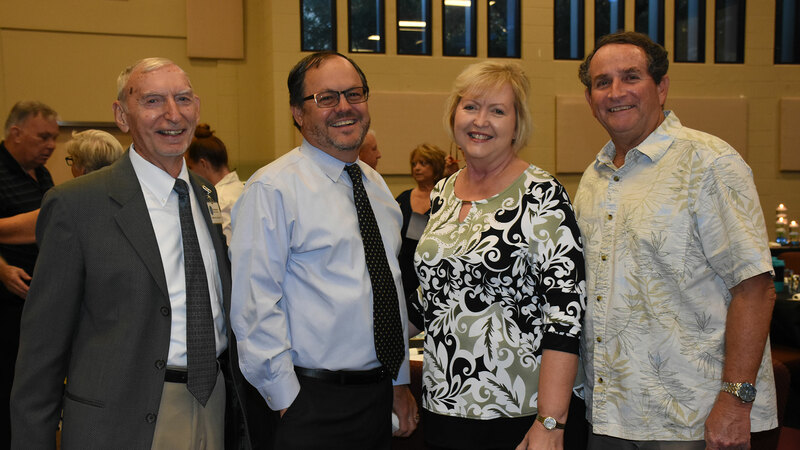 At the fundraising banquet in September, ISO raised $10,500 in cash and garnered pledges for an additional $7,000. 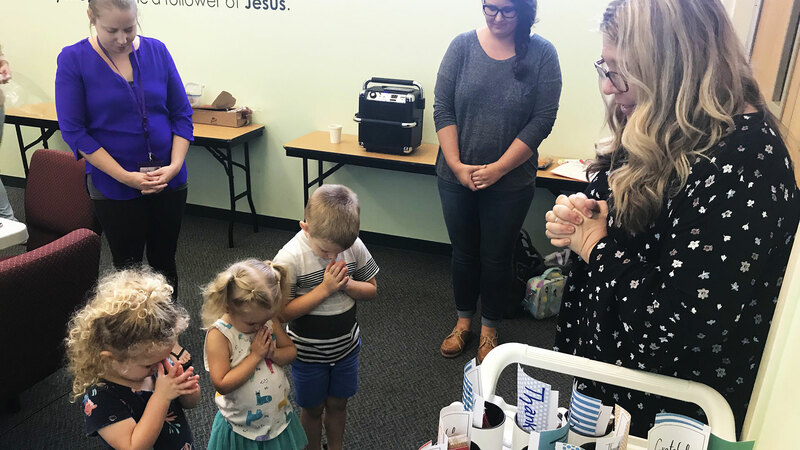 Recharge and Refuel Several times each semester, we serve coffee and goodies to the parents of the children who attend our preschool (University Carillon Early Learning Center). The goal is to give the parents an excuse to slow down, enjoy a snack and have a conversation… with no strings attached. You pick up a blue Community Pantry bag, take it home and fill it with mac & cheese, black beans, a few cans of Spaghettios … and bring it back the next weekend. Then what? Volunteers (often Gerry DeBelles) transport the bags over to Faith United Methodist Church off Dean Road in Union Park. There, Pastor Matt Findlay and others unload the bags onto shelves in anticipation of the 40-60 families from the surrounding community that will arrive the next Thursday—and every Thursday after that—in need of food. 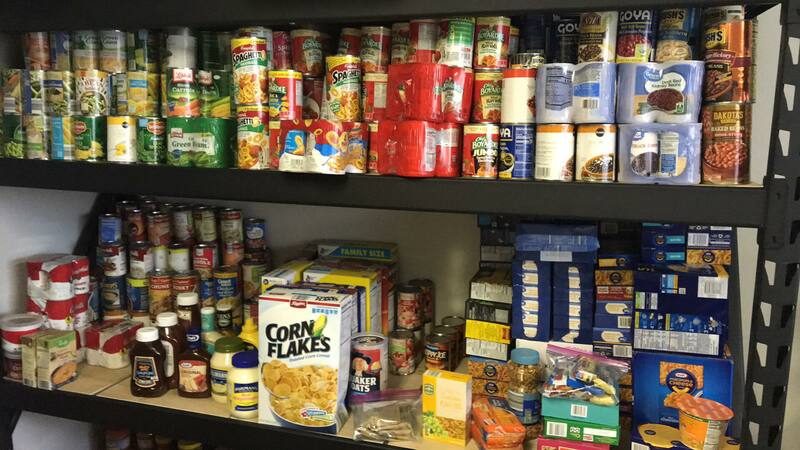 By the time we are filling bags again, the shelves are nearly bare. Thanks for helping us support Faith UMC as they help people grow spiritually through seeking God, building family and feeding the community. 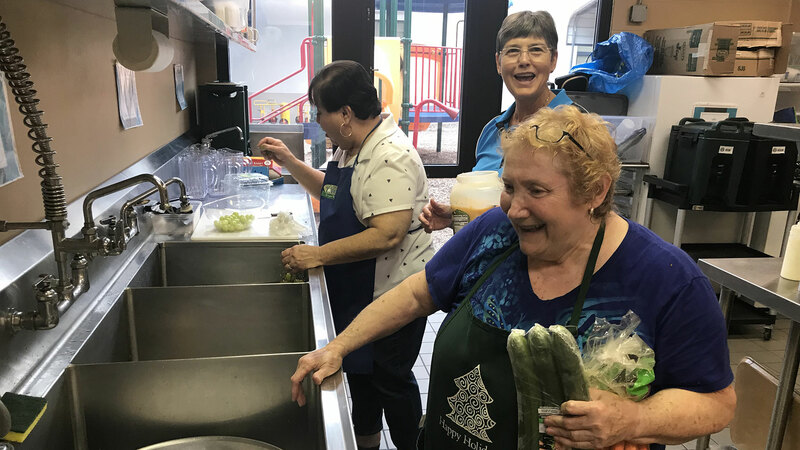 The hustle and bustle in the kitchen begins in the early afternoon as Miss Maria and her helpers cook main and side dishes, wash and pare vegetables, cut cakes, fill bowls with fruit, and do whatever else it takes to put on a wonderful dinner. 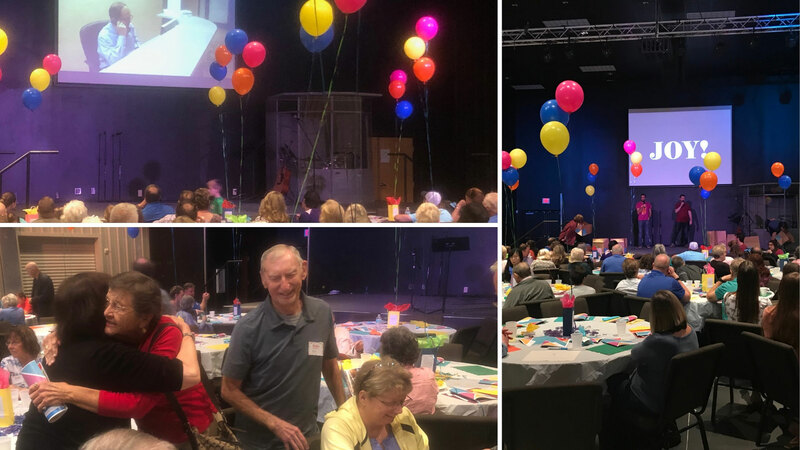 Elsewhere, our pastors and group leaders get ready for the classes that will follow the meal, and our children’s ministry team readies rooms and lessons for eager and energetic children. In the EPICenter, our youth team braces for the arrival of scores of middle schoolers. Even if you can’t get here in time to enjoy a great meal (for a great price), consider joining one of our discussion-based classes for adults. (It’s not too late to start!) Take advantage of this opportunity to get a spiritual nudge in the context of community. Back to School Thanks to your donations and volunteer hours, we outfitted 120 Bonneville Elementary School students with backpacks, school supplies, clothing and haircuts. Additional supplies were left at the school for late-registering students. We continue to partner with Bonneville through the academic year as Reading Buddies. When the whistle blows for the kickoff of the first quarter of the UCF Knights football games, volunteers at University Carillon will have guided up to 520 cars to their parking spots, handed out 800-1000 hot dogs and greeted hundreds of fans headed to Spectrum Stadium. UCF built an on-campus stadium in 2007 (moving from the Citrus Bowl in downtown Orlando, where they had played since 1979), and the church found itself in a prime spot to park game-goers. (“We either had to prevent parking … or embrace it,” Pastor Chris says. “We decided to embrace it.”) That started one of University Carillon’s most visible and most enjoyable outreach opportunities. Now, on any given football night, 7-10 people are on duty just to guide parkers, and 20-25 people show up to grill hot dogs, pass out food and water, and engage fans as they walk by the front of the church. Not all who park here are from UCF. Many of the opposing teams have learned that University Carillon is a friendly parking venue, and now their alumni associations help us spread the word. It’s work—no question—but game-day volunteers tend to be passionate about what they do. Steve “Hutch” Hutcherson has been volunteering at games since early on. He recently relocated to Ormond Beach, but hasn’t quit his job as a parker. He plans to drive back as often as he can to help out. 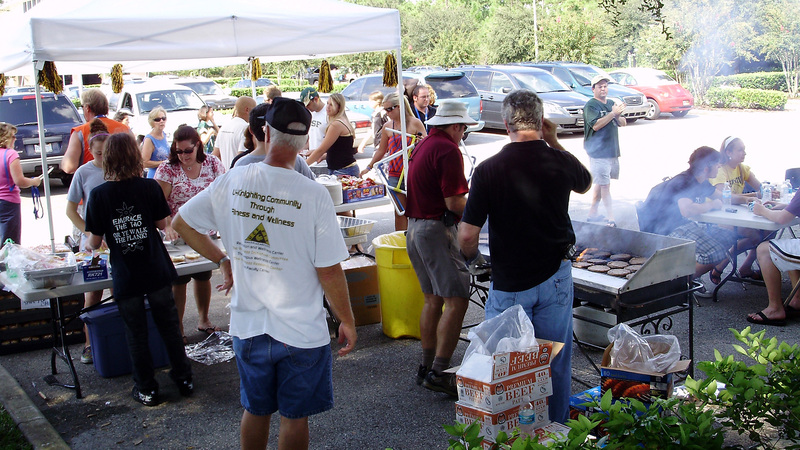 If you want to get in on this fun and impactful outreach opportunity, contact Thom to learn about the parking team (ThomFawcett@ucumc.net) or Pastor Chris (ChrisAkers@ucumc.net) to check out the grilling team.